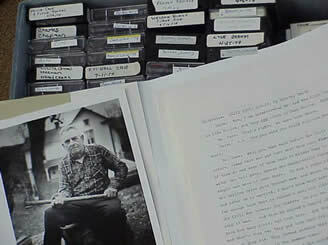 Records the reminiscences of Randal Dean, who was born and raised on Dean Mountain, near Elkton, Virginia, an area that became part of Shenandoah National Park. Describes home and family life, school days, farm chores, livestock and his work in his father's saw mill. Discusses family gatherings, such as holidays, apple butter boilings, hog butchering and funerals. Includes references to bark peeling and local moonshiners. Mountain people -- Blue Ridge Mountains -- Social life and customs; Mountain life -- Shenandoah River Valley (Va. and W. Va.) – History; Mountain people -- Virginia -- Shenandoah National Park -- Social life and customs; Rural poor – Virginia; Country life -- Appalachian Region, Southern; Agriculture -- Appalachian Region, Southern; Food habits -- Appalachian Region, Southern; Folklore -- Shenandoah River Valley (Va. and W. Va.) – History; Holidays -- Shenandoah River Valley (Va. and W. Va.) – History; Traditional medicine -- Shenandoah River Valley (Va. and W. Va.); Livestock; Distilling, Illicit – Virginia; Bark peeling -- Virginia -- Rockingham County – History; Forest products industry -- Shenandoah River Valley (Va. and W. Va.) – History; Land use -- Government policy -- United States. Dean Mountain (Va.); Rockingham County (Va.) – History; Shenandoah River Valley (Va. and W. Va.) -- Manners and customs; Shenandoah National Park (Va.) -- History, Local.